Team Hawaii rowed up the Hudson River past the lower Manhattan skyline yesterday in the Liberty World Challenge outrigger canoe race in New York. NEW YORK >> Team Hawaii has no peer at the Liberty World Challenge outrigger canoe race. 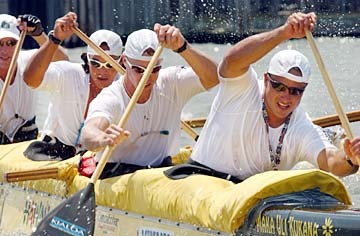 Hawaii won the men's division of the paddling event yesterday in New York City for the fifth consecutive year. Hawaii won the race, which has been run six straight years, in 1 hour, 57 minutes, 25 seconds -- more than eight minutes ahead of the closest competitor. The 14-mile course passes Governors' Island, the Statue of Liberty and Ellis Island before finishing at Pier 84. The paddlers headed down the Hudson River. Hawaii won the event for the fifth straight year. Nine countries, and 100 teams, were represented in the race, including the United States, Australia, Japan, Tahiti, Brazil and Germany. Members of Team Hawaii were James Foti, John Foti, Mike Judd, Thiebert Lusia'a, Keali'i Pa'aina and Walter Guild, the team captain and manager. Newport Aquatic Center (Calif.) finished second in the race in 2:05.38 and Manuiwa (Conn.) placed third in 2:07.56. Team Hawaii did not send a women's team to the Liberty World Challenge this year. Offshore Canoe Club (Calif.) won the women's event in 2:16.05. Team Hawaii returns to the islands tomorrow. SANDY, Utah >> Former Hawaii volleyball standout Heather Bown scored 10 points Friday night as Team USA swept Italy 3-0. The match kicked off a four-match domestic tour for the national team. Keba Phipps scored 14 points in her return to the team and Logan Tom added 13 in her return to her hometown. Bown scored her 10 points on six kills, three blocks and an ace. "Tonight's match was a starting point for our team," Bown said. "I believe the win tonight gives us a step in the right direction. "The team effort was 100 percent. Hopefully we can continue this path and improve as a team for the rest of the season." The teams meet again today. Willoughby nearly leads upset: At Tijuana, Mexico, Kim Willoughby scored 16 points and the USA training team almost shocked defending gold medalist Cuba. Willoughby had a team-high 12 kills, two blocks and two aces. The training team is competing against the top national teams of other countries. Stanley a hit for men's team: At Louisville, Ky., former UH star Clay Stanley had 14 points as the USA men's team swept Australia for the second match in a row. The U.S. (4-10) and Australia play twice more. Four Hawaii Academy gymnasts have qualified to compete in the USA Gymnastics Trampoline and Tumbling Junior Olympic National Championships. Aleia Monden, Matt Moniz and Kira and Nani Vercruyssen will compete at the event in Indianapolis from July 10 to 16. They are the only qualifiers from Hawaii. They will be competing in power tumbling, trampoline and double-mini trampoline.